I'm working on my backlog of reviews. I've debated just posting them all, but then I'm afraid I won't have new content when I go on vacation this summer. The paperback edition of A Million Suns will be out in November. I tried to win a copy when the hardcover was released in January. I did win a paperback copy of Across the Universe during the release day activities, so maybe I'll be lucky again when the third book is released. I listened to the audio version of Across the Universe last summer and you can see my review here. I wasn't sure if I was going to be able to read A Million Suns without purchasing a copy. After my unsuccessful attempts at getting a review copy or winning a copy, I checked with my library. My librarian said that there wasn't much interest in the first title so they had no plans of purchasing the second. I was bummed. I still held out hope for the audio book to come to the digital library, but those were dashed when Penguin announced they were pulling out of the Overdrive system (Razorbill is a Penguin imprint). Finally in March, I decided I would put a hold on it and when it left the new books shelf at a library somewhere in Georgia I would get it then. Lo and behold, if a library in my system didn't get a copy. I devoured A Million Suns. I knew I only had 2 weeks to read it, but the story was so gripping that I read it in a weekend. While I had trouble getting into the story, the ending was well worth the struggle. I cannot wait until the next one comes out. If anyone out there has connections to Razorbill and can help me get on their list for review copies I would love you forever! I think I preferred the story as an audio book. I think the problem I had with getting into the story wouldn't have been had I listened to it. I kept trying to capture the narrators' voices from Across the Universe and when I finally stopped I really got into the story. I love the characters of Amy and Elder (or is it Eldest?). I'm not sure I'm rooting for them to be a couple though. And I'm glad that the romance takes a backseat somewhat to the adventure. There are so many what ifs and I'm not sure what I would do in their place. Beth does a great job of getting the reader to see both sides to the issue. For example, I know that it is wrong to drug people into submission, but given the details of the situation I have to wonder if it wasn't better. If you haven't started this series, I highly recommend it. I'm greatly disappointed that it isn't in greater demand among the teenagers in my community. As an adult I found it quite entertaining - put it on your summer reading list! I was really disappointed it the first book. The world building was excellent but the story and characters were thin at best. I enjoyed the sections about the ship and the history a lot more than the supposed "mystery" which I figured out as soon as Elder v1.0 showed up in his other identity. I'd like to read book 2 but I'm worried that the content just isn't going to be there again. Has Revis improved as a writer at all? This book definitely felt like a filler book. It was needed for the transition but did it really move the story forward? Not sure. 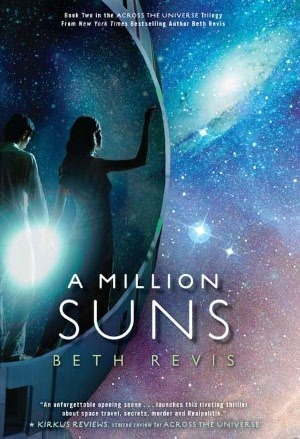 I'm enjoying the series as a whole, but I'm not sure if A Million Suns must be read before reading the next book. If you were disappointed with Across the Universe, you will probably be disappointed with A Million Suns. There isn't any more character development.